Protect and avoid the hassle of ruining your counter or tabletop with the HealthPro Bamboo Trivet Set. It's a heavy duty, eco-friendly trivet set that's made to last. Polished and laminated to give it a unique appearance. Made from 100% organically grown Moso Bamboo. The trivets blends well with any table top and will complement the décor of your home. Protect your table no matter what hot metal or glass cookware you put on it. Spread the word of environmental friendliness with the bamboo trivet. 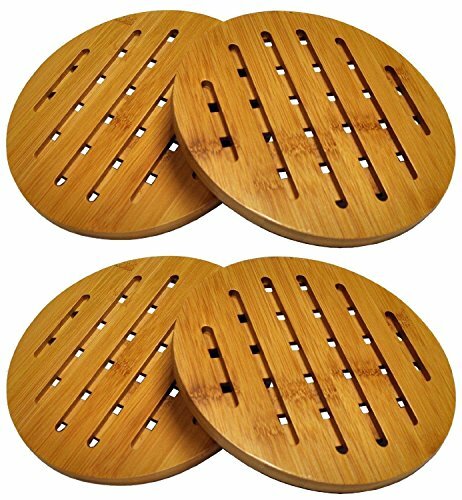 HealthPro's bamboo trivet is perfect for any occasion. From everyday use to weddings, birthday parties, bridal and baby showers, graduation parties, family reunions, bachelor parties, to beach events and the rest, it presents the perfect opportunity to show your support for a healthier environment. If you have any questions about this product by ProHealth, contact us by completing and submitting the form below. If you are looking for a specif part number, please include it with your message. Ambrosia Maple Wood Lazy Susan Turntable 16"
Alessi Tripod Trivet. Metal Adjustable Elements. Designer Metal Trivet. Designed by Gabriele Chiave. Nice Housewarming Gift. Unique Home Decor.